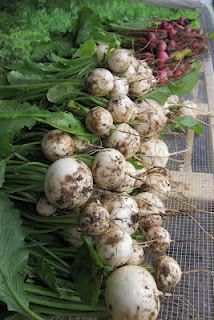 My camera is currently missing, so in the meantime, please admire this completely unrelated photo of lovely turnips from Daily Harvest Farm. Last week, I had some gorgeous skirt steaks from The Piggery to grill, and some gorgeous swiss chard from my CSA box, but I needed something else to round out the meal. Enter this pasta salad, which was dreamed up by my colleague from Gourmet, Gina Marie Miraglia Eriquez, whose name, though a mouthful, should be a household word for her genius recipes. I have made it a bunch of times, and it is always awesome, either warm, at room temperature, or cold, the leftovers eaten right from the container. Strangely, I remembered it with lemon and parsley, but now that I am re-reading the recipe, I can see that was my addition early on. On this particular day, I didn’t have acini di pepe or olives in the house, and though I did have parsley, I also had a nice bunch of chervil from the CSA box that I didn’t want to go to waste. Cook the pastina until it’s al dente. Combine all the other stuff in a large bowl. Strain pasta and pour over the stuff in the bowl; toss and season as desired with additional salt, freshly-ground black pepper and lemon juice.